Glue the small piece of twine onto the tip of the letter in the shape of a small loop. This way you will be able to hang your feeder outside. Paint the cardboard with peanut butter. Coat a nice layer so that the seed and Cheerios™ will stick well. You can outline the letter in Cheerios™ and then pour birdseed over the peanut butter to completely coat the letter. Use your fingers to pat the birdseed into the peanut butter. You should only see birdseed and Cheerios™, since the peanut butter is hidden below. Spring is here and the weather is warming up—yay! I love all seasons, but spring is just so fresh and always smells beautiful with the blooming flowers. It gets me extremely excited for summer days! Now that the days are a bit longer and the weather is warmer, it’s time to get going on some outdoor crafts, especially if you have little ones running around your house! 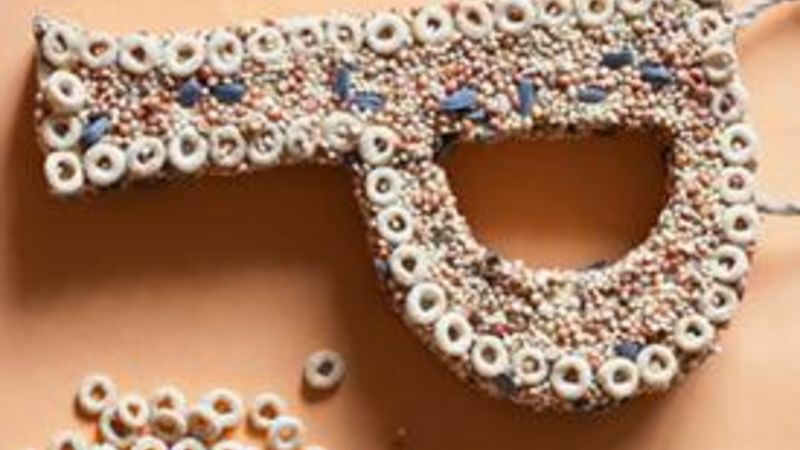 Since the birds are out and looking for some yummy treats to nibble on during the day, why not make a Cheerios Birdfeeder to hang outside? It’s a great craft for the kids and educational to see the different species of birds that fly up to grab a bite. You could even print out a photo chart with pictures of bird species in your area so you’ll be able to identify them when they approach your homemade birdfeeder. To make these birdfeeders, get out your supplies: cardboard letters, hot glue (hot glue should only be used by an adult), twine, peanut butter, birdseed and a box of Cheerios. Paint the cardboard with peanut butter. Coat a nice layer so that the seed and Cheerios will stick well. Pour birdseed and Cheerios over the letter to completely coat the peanut butter. You should only see birdseed and Cheerios, since the peanut butter is hidden below. That’s it! Enjoy the spring and bird sightseeing in your own backyard! Inspired by all the birds you're seeing at the feeder? Make your next party bird-themed!